It's the AGE OF THE GEEK in Pasadena. “Rawr” means “I love you” although if it’s Allosaurus pursuing Stegosaurus is might actually mean “I’d love to have you for lunch.” Although more than one dinosaur ends up at the wrong end of the dinner table, “Walking with Dinosaurs: The Arena Spectacular” family friendly. Even if you’ve seen it once, it’s worth seeing a second time and even a third, but don’t wait because it’s only in Anaheim at the Honda Center until Sept. 7. Then it moves up to the Los Angeles Staples Center for seven performances, Sept. 11-14. Based on the award-winning BBC TV series, this show is both educational and entertaining. If you love dinosaurs, if you love animatronics, if you love gadgets big and small and if you love puppets, this is the show for you. This isn’t the first time this show has come through Southern California and there have been a few tweaks to the script and a few feathers have been ruffled and then applied to the dinosaurs to keep up with our current understanding of how they looked. Guided by our paleontologist emcee, we go in chronological order as an egg hatches and life begins and the dinosaurs begin and slowly evolve into giants before their world ends. Look at it as an opportunity to relive your childhood and your obsession with those thunder lizards. Look at it as a chance to check out the latest dinosaur T-shirts and goofy dino hats. Take it as time to wear your dino gear (Dinosoles, Van’s T-rex shoes or your best dinosaur tie). Share your love with other dinosaur lovers and rawr when Tyrannosaurus Rex looks you in the eye and declares its motherly love for the tiny baby Rex. No matter where you sit, the show is choreographed so that each section gets a good look at the dinos, front and back. 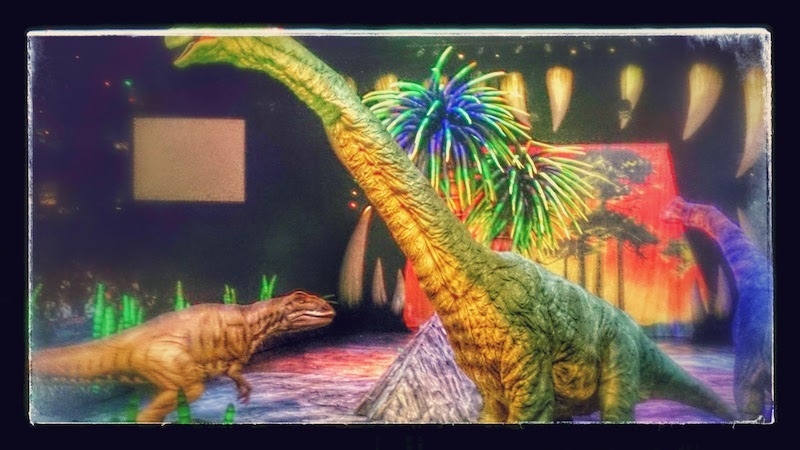 “Walking with Dinosaurs: The Arena Spectacular” continues until 7 September 2014 at the Honda Center, 2695 E. Katella Ave., Anaheim. Fridays, 7 p.m.; Saturday, 11 a.m., 3 p.m. and 7 p.m.; Sunday, 1 p.m. and 5 p.m. $22.50-$79. (800) 745-3000. The show then will perform from 11-14 September 2014 at the Staples Center, 1111 S. Figueroa Street, Downtown Los Angeles. Thursday, 7 p.m.; Friday, 7 p.m.; Saturday, 11 a.m., 3 p.m. and 7 p.m.; Sunday, 11 a.m. and 3 p.m. $22-$79. (888) 929-7849. Tickets are also available through Ticketmaster.